Nearly every pet will be exposed to parasites at some point in their lifetime, whether it's fleas, ticks, heartworms, or intestinal parasites. This guide focuses on the most frequently asked questions about prevention and management of exposure to these common pests! Does my pet need monthly heartworm prevention? It's recommended that all pets, dogs and cats, receive heartworm preventatives. Even if you live in a low-risk area, the risks associated with heartworm disease are considered greater than the risks associated with providing monthly prevention. In fact, the American Heartworm Society recommends a year-round preventative regimen regardless of lifestyle or geographical region as heartworms have been diagnosed in all 50 states and are regionally present in the main 48 and Hawaii. Learn more about Heartworm Disease in pets here. Do I need to treat my indoor pet? Similar to fleas, it's far too easy and common for a mosquito to make it's way indoors through an open door, window, or sometimes even small holes in screens. Even indoor animals should be given a monthly preventative year-round to ensure that even one mosquito bite won't infect your pet with heartworm disease. Can I use mosquito repellant on my dog? Please don't ever apply DEET or other human-formulated mosquito repellants to your pet, as these can have serious and potentially deadly side effects in animals. Fortunately, many of the topical flea and tick products on the market actually contain ingredients that help repel mosquitos as well, and will be sufficient to prevent bites on your pet all summer long. Why isn't flea control resolving the issue? Using the wrong product for the flea life cycle. Forgetting to treat all animals in the house (even if they never go outdoors). Forgetting to clean carpets, linens, and bedding. More information about using pet flea control products safely and effectively can be found here. Why is my pet so itchy despite not having fleas? I've tried everything! What else can I do for my flea problem? Fleas can be difficult to control, and our team certainly understands that. Sometimes, just a fresh look at what you've tried, the products you're using, and your pet's lifestyle can set your war against these pests back on the right track. The team at whiskerDocs is prepared to review the situation and help you make the best decision on the next best steps to take for your pet. You've got pets, we've got answers! How did my pet get bitten by a tick even though I use a preventative? Unfortunately, no flea or tick preventative is ever 100% effective. That said, it's actually more likely that you're using a preventative that doesn't provide adequate protection for your geographical region. Surprised? 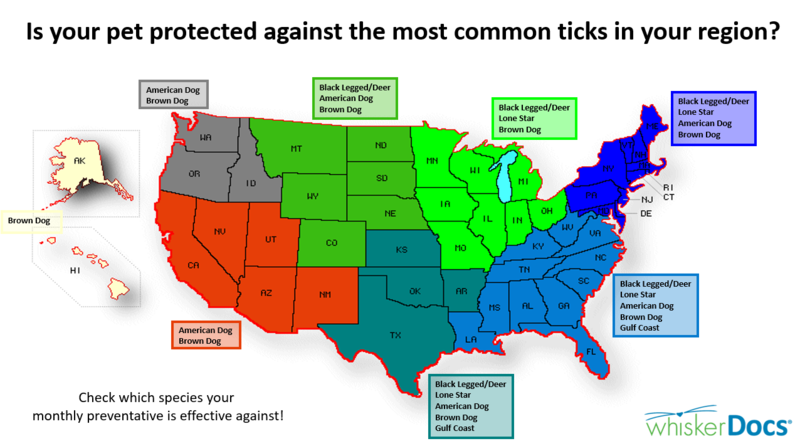 Have a look at the map above to see the types of ticks in your area. You might be surprised to learn that your monthly preventative is only protecting against a couple of species of ticks, and doesn't have coverage for the others! How do I make sure I'm using the correct tick protection for my pet? Below is a table of some of the most common flea, tick, and heartworm preventatives on the market. Please note that this is not an all-inclusive list. Could my pet get sick from a tick bite? Depending on the species, ticks are known carriers of 16 different pathogens, each of which could make you or your pet ill. The most common afflictions are Lyme disease and Bobcat Fever, but there are others as well. It's important to make sure you're using the correct tick preventative for your pet's lifestyle and your geographical location so you can signifcantly reduce the risk of your pet's exposure to these illnesses. How do I safely remove a tick? Gently tweeze the tick from as close to the skin as possible. Be careful not to twist the tick, as this could leave parts of the mouth attached to your pet. Also, take care to avoid squeezing the engorged part of the tick, as doing so could cause the blood to return to your pet's bloodstream and increase the risk of infection of any pathogenic diseases that tick may have been carrying. Do not use alcohol or vaseline to try to remove the tick. If possible, save the tick in a glass jar for identification in the event your pet does become sick after a tick bite! Tell us about your pet, your geographical region, and ask away! Our veterinary experts are standing by!